Our Origin bifolding doors come in a huge choice of colours. You can choose from over 200 possible colours including different colours inside and out. At Basfords, we know that there are many properties that look better with timber doors. These are traditional properties that had original timber window fitted. Many of these windows are still working brilliantly today, testament to their excellent construction. 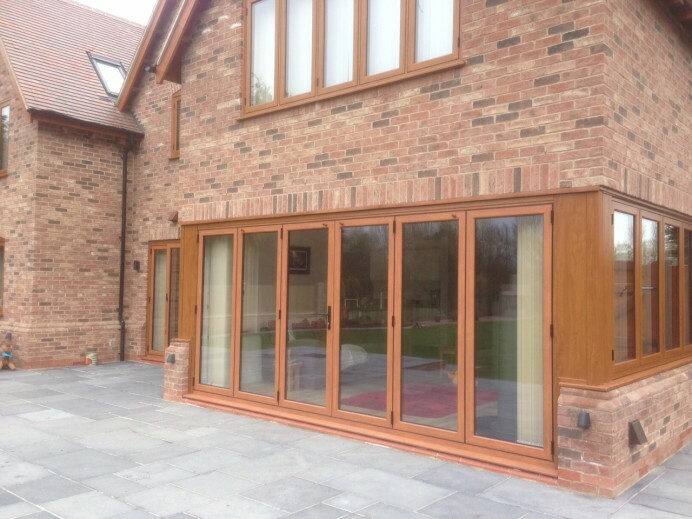 If you’re looking to add bifolding doors to your home, you may be considering timber bifolds. These too are great products but can be quite expensive. And whilst timber doors now benefit from great quality and colour, you still need to make sure they’re maintained to preserve their long service life. If you are looking for something more cost effective with none of the anticipated maintenance Basfords have the solution. There’s now a stunning wood effect finish on aluminium bifolds. It gives you the look and feel of real wood, with all the advantages of an aluminium folding door. Our stunning Origin doors come with the look of wood and all the advantages of aluminium. Our class leading Origin bifolding doors are available with a choice of wood effect finishes that are totally authentic in their appearance. When you see this woodgrain aluminium finish for yourselves, we are sure you’ll be impressed. There are four wood effect finishes available. These are Natural Oak, Golden Oak, Mahogany and Walnut. So what’s behind this innovative wood effect colouring to aluminium bifolds? Whilst PVCu woodgrain foils have advanced significantly in recent years and is of great quality. But aluminium offers other benefits. Examine a woodgrain PVCu door and you’ll notice that many of the invisible surfaces (those you can’t see when the door is closed) aren’t coated the same as the visible surfaces. This is because foils can’t reach every detail of the profile. Door profiles today feature grooves, recesses and lips designed for weather performance, locking systems, for gaskets and other critical components. Foils can’t be shaped around these fine details, but it’s possible with aluminium. How are wood effect aluminium doors coated? The finishing process applied to our Origin wood effect bifolding doors is completely different. First of all the aluminium bars are powder coated with a strong base coat. Once this process is complete, the profiles are wrapped in special bags containing the desired wood effect finish. These are vacuum sealed, extracting all the air out of the bag. A hand finishing method bonds the bag still further to the profile and especially the unseen faces. The wrapped profile in then placed in a special ‘sublimation oven’. Profiles are heated to over 200 degrees centigrade and the wood effect finish bonds onto the aluminium profile on all it’s surfaces. The result is a wood effect finish that looks and feels just like real wood. It has a totally different visual effect from a foil. Better still the aluminium bars have a far more durable coating even than the already durable standard polyester powder coat. A final advantage is that should the profile get accidentally damaged, the repair process is actually simpler than with a standard coloured door. Discover the industry leading Origin bifolding door. Choose from Golden Oak, Natural Oak, Walnut and Mahogany. This exceptional finish enhances the many industry leading features found in our Origin folding doors. Exceptional quality hardware and running gear. If you’re in the market for a new bifolding door and desire a timber or woodgrain door, visit our showroom and discover this stunning and authentic wood effect finish. You’ll get all the benefits of an aluminium bifold with a durable, quality wood effect finish that will last. Contact us for further information and a free quotation or visit our showroom.